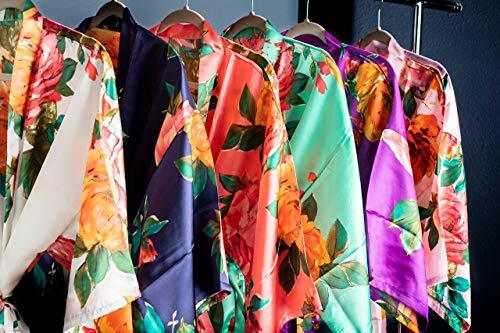 Our kimono style robes are made with a high quality light weight satin fabric with a beautiful watercolor floral design. They are available in six different colors. The robes feature an inner tie and a matching sash for a comfortable fit. The robes are one size fits most. Fits sizes 0-14 or up to size XXL. The length is 36 inches. These robes make the perfect gift for your bridesmaids! Add a monogram, single initial, name or their title to the front chest for a truly personalized gift. This is a gift your bridesmaids can use for years to come! ►►CARE INSTRUCTIONS◄◄ Machine was cold on gentle cycle. Hang to dry.